Here’s a great longread from The Verge called Engineers of Addiction about the psychology of slot machines and the tech industry. “Bally Technologies, one of the world’s largest manufacturers of slot machines. the expansion of gaming generally is the expansion of slot machines specifically — the modern casino typically earns 70 to 80 percent of its revenue from slots, a stratospheric rise from the 1970s when slots comprised 50 percent or less. …increasingly, the psychological and technical systems originally built for slot machines — including reward schedules and tracking systems — have found admirers in Silicon Valley. The prototypical slot machine was invented in Brooklyn in the mid-1800s — it was a cash register-sized contraption and used actual playing cards. Inserting a nickel and pressing a lever randomized the cards in the small display window, and depending on the poker hand that appeared, a player could win items from the establishment that housed the machine. 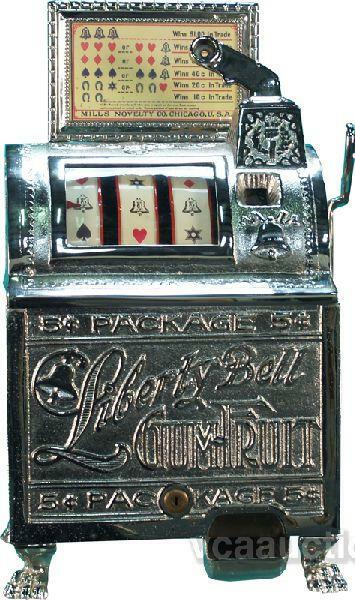 In 1898, Charles Fey developed the poker machine into the Liberty Bell machine, the first true slot with three reels and a coin payout. Each reel had 10 symbols, giving players a 1-in-1,000 chance of hitting the 50-cent jackpot if three Liberty Bells lined up. The three-reel design was a hit in bars and became a casino standard, but for decades gaming houses considered them little more than a frivolity — distractions for the wives of table-game players. Accordingly, casinos were dense with table games, and slots were relegated to the periphery. That began to change in the 1960s, when Bally introduced the electromechanical slot machine. The new rig let players insert multiple coins on a single bet, and machines could multiply jackpots as well as offer up smaller, but more frequent wins. Multi-line play was introduced: alongside the classic horizontal lineup, players could now win with diagonal and zig-zagged combinations. The new designs sped up gameplay and breathed life into the stagnating industry. William “Si” Redd, the bolo tie-wearing Mississippi native who oversaw some of Bally’s new projects during the era, was instrumental to that renaissance. “The player came to win,” he said, “he didn’t come to lose, [so] speed it up, give him more, be more liberal. Let him win more, but then [you make money] still with the speeding up, because it was extra liberal.” In other words, the new machines lowered slots’ volatility — gaming parlance for the frequency at which a player experiences big wins and losses. In the 1970s, Redd left Bally and founded another gaming manufacturer that was later renamed IGT. IGT specialized in video gambling machines, or video poker. Video poker machines could be designed to have even lower volatility, paying players back small amounts on more hands. And video poker’s interactive elements made them extra engrossing, turning them into an enormous success: people lined up to play the first machines, and the game’s ability to command a player’s complete concentration for hours gave it a reputation as the “crack cocaine” of gambling. “If you were to take $100 and play slots, you’d get about an hour of play, but video poker was designed to give you two hours of play for that same $100,” Redd said at the time, instructing game designers to lengthen the time it took a poker machine to consume a player’s money. Redd also acquired the patent for the newly created Random Number Generator, which computerized the odds-calculator behind the spinning reels and allowed game makers to control volatility. A modern slot machine, at its core, is nothing more than an RNG going through millions or billions of numbers at all times. When a player hits a spin button, they are simply stopping the RNG at a particular moment. Everything beyond that — the music, the mini-games, the actual appearance of spinning reels, Rachel, Monica, and the rest of the gang keeping you company — is window dressing to keep you hitting spin. IGT now makes 93 percent of the world’s video poker machines and is the largest manufacturer of video slots in the world. Its Wheel of Fortune franchise spans every kind of slot machine — reels, curved screens, and massive installations with enormous physical flourishes. …certain principles undergird most games. First, there’s a vague aesthetic uniformity: colors tend toward the primary or pastel, franchise tie-ins are a must, and the game soundtracks are typically in a major key. Meanwhile, the multi-line wins introduced by Bally have become an unintelligible tangle: modern slots offer players upwards of 50 and sometimes 100 different winning combinations — so many that without the corresponding lights, sounds, and celebration, most casual and even advanced players would have trouble recognizing whether they’d won or lost. To keep players gambling, all slots rely on the same basic psychological principles discovered by the B.F. Skinner in the 1960s. Skinner is famous for an experiment in which he put pigeons in a box that gave them a pellet of food when they pressed a lever. But when Skinner altered the box so that pellets came out on random presses — a system dubbed variable ratio enforcement — the pigeons pressed the lever more often. Thus was born the Skinner box, which Skinner himself likened to a slot machine. The Skinner box works by blending tension and release — the absence of a pellet after the lever is pressed creates expectation that finds release via reward. Too little reward and the animal becomes frustrated and stops trying; too much and it won’t push the lever as often. Like video poker, most multi-line slots rarely pay large jackpots, instead doling out smaller wins frequently. “They’re imitating the formula of video poker, but they’re doing it in a slot formula,” Natasha Schüll, an associate professor at MIT who has researched slots for 15 years, says. In 2012, Princeton University Press published Addiction by Design: Machine Gaming in Las Vegas, the culmination of her research and a deconstruction of the slot machine. That analysis is supported by a 2010 American Gaming Association white paper. “Lower-volatility games often have greater appeal in ‘locals markets’ than in destination resort markets like Las Vegas or Atlantic City…Customers tend to play these games for longer periods of time…” In other words, lower volatility games paved the way for gaming’s wild expansion nationwide. Price and I spoke on the floor of Harrah’s Las Vegas at 9:00AM — the slots players were already at their machines, or perhaps they’d been there all night. As long as a player has her Total Rewards card inserted in the machine, every time she hit the spin button the system recorded the size of her bet, what game it was spent on, at what time, how long she’d been playing for, and so on, until she hits the “Cash Out” button on the machine, at which point all the data is encapsulated in her file, along with all the other games she has ever played at a Caesar’s casino. Player tracking systems revealed more than a pit boss ever could: over time, Harrah’s can create a portrait of the player’s risk profile, including how much money a player typically loses before they stop playing and what kinds of gifts to give them to keep them on the gaming floor. Sometimes, that can be a penthouse suite; other times, it can be as little as giving a player $15 in cash. In 2012, charted the lurid and unsettling extreme of how these systems can be used in a story about a Harrah’s in Indiana that enticed a woman to keep playing with unlimited hotel suites, diamond jewelry, and free trips to the Kentucky Derby. The perks fueled her gaming habit until she was $125,000 in debt. …Jack and Singleton say they’ve both earned “Black Cards” through Sugarhouse’s player tracking system, meaning they’ve each spent more than $10,000 here. Jack says the casino has comped them four cruises so far; Singleton says she threw her card away because it reminded her of how much money she’d spent. I had more questions, but at a certain point it became apparent that Singleton was no longer listening. “She’s in the zone right now,” said Jack. The “zone” is at the core of Scüll’s theory about the success and proliferation of slot machines. She heard the term over and over again in her 15 years of research — the players repeatedly told her that they played to zone out, to escape thought. To understand the zone, you first have to understand “flow,” the concept developed by Hungarian psychologist Mihaly Csikszentmihalyi to describe a hyperfocused state of absorption. During “flow,” time speeds up (hours feel like minutes) or slows down (reactions can be made instantly) and the mind reaches a state of almost euphoric equilibrium. Schüll, in her book, describes Csikszentmihaly’s four criteria of flow: “[F]irst, each moment of the activity must have a little goal; second, the rules for attaining that goal must be clear; third, the activity must give immediate feedback; fourth, the tasks of the activity must be matched with challenge.” For most of their history, slots easily fulfilled the first two criteria; after lowering volatility, they fulfilled the third criterion, and with the introduction of multiple lines, endless bonus rounds, and the occasional mini-game, they finally fulfilled the four criteria. The “zone” is flow through a lens darkly: hyperfocused, neurotransmitters abuzz, but directed toward a numbness with no goal in particular. When Singleton emerged from the zone, I asked her again why she found the slots so compelling. “I lost my husband two years ago to throat cancer,” she explained. “He was the love of my life, and I started doing this just to — I was out of my mind and spent a lot of time at the cancer center.” Jack had lost his son to pancreatic cancer. As they told their stories, Jack and Singleton hit the spin buttons and the machines blared so loudly that their words were lost in the noise. “Right, so you know that,” said Singleton. “Every now and then…you get something,” Jack agreed. Singleton rifled through her wallet filled with $100 bills. “I’ll be right back, guys,” she said, and went off to get change. Back at the Bally showroom, Trask and I had sat in front of the company’s new Duck Dynasty game. “There’s never been more slot machines in the world than there are today,” he said. “And that’s proliferation not just in the US, but abroad.” His hand rested on the game’s display, his index finger next to a reel symbol of a cast member sticking his tongue out and playing air guitar. Scientific Games’ market now includes 50 countries on six continents. This spring, the company announced it was planning on providing 5,000 of the 16,500 machines recently authorized in Greece. The industry seems to be working on the same hunch. In 2011, Caesar’s acquired Playtika, an online casino games company that offers free and paid mobile games. A year later, IGT acquired the free casino games app DoubleDown, which runs as both a stand-alone mobile app and through Facebook. The company now offers online table games and a good sample of its portfolio of slots, including Wheel of Fortune, to mobile players. Earlier this year, the gaming giant appointed former Zynga studio manager Jim Veevart as DoubleDown’s vice president of games. And last year, Churchill Downs Incorporated, which runs seven casinos in addition to its Kentucky Derby racetrack, acquired the free games company Big Fish Games. Meanwhile, the tech sector is adopting the principles of slot design for its own purposes. In the early aughts, the tech writer Julian Dibbell devised the concept of ludocapitalism, a term inspired by watching World of Warcraft players mine gold in the game to making a living in real life. Ludocapitalism was an attempt to explain the growing gamification of society through technology. Dibbell admits the concept’s parameters are vague, but at its most basic it identifies that capitalism can harness the human play drive for better or worse — and that increasingly, games aren’t allegories that say something about our lives; they are our lives. As people move toward more data-driven existences where points are accumulated from health apps (the subject of Schüll’s latest research) and status is accumulated in identifiable quantities on social media, gamification becomes so total that it can sometimes mask whether what we’re doing has any inherent utility outside the game that surrounds it. Within gamification, Schüll also identifies slotification: we slay an endless procession of monsters with no progress of narrative, mine endless digital coins for no other reason than their aggregation, hit spin on the slot machine with no big payoff. “It’s this ludic loop of, open and close, open and close; you win, you lose, nothing changes,” Schüll says. Writing in The Atlantic, Alexis Madrigal tapped Schüll’s concept of the ludic loop to explain the inextricable entrancement of flipping through Facebook photos: you push a button over and over, primed for an eternally fleeting informational reward. A more exact replica of a slot may be Tinder. The mechanics of the dating app mirror the experience of playing slots: the quick swiping results in an intermittent reward of connection, followed by the option to either message your potential date or “Keep playing.” Tinder recently launched a premium version that allows the user to undo an accidental “not interested” swipe, essentially monetizing mistakes made while in the automatic rhythm of the zone. Last year, Schüll heard from Nir Eyal, a tech entrepreneur who founded and sold two startup companies that produce advertisements in free-to-play games. “[Eyal] showed me his copy of my book, and it had, like, hundreds of hot pink sticky notes coming out of it,” she told me. In his 2003 book Hooked: How to Build Habit Forming Products, Eyal laid out his “Hook Model” of product development that works on basic behaviorist principles: a trigger turns into an action turns into a variable reward turns into a further personal investment back into the product. Last year, he invited Schüll to speak at his Habit Summit, hosted at Stanford. Schüll gave a talk on the “dark side of habits,” placing slot machines on the undesirable end of the habit spectrum. I asked Eyal what distinguishes mobile games or dating apps from slot machines. He gave a range of answers that sounded at once comprehensive and somewhat defensive — that tech addictions never really plummet to the league of gambling addiction; that people prone to addiction will be addicted no matter what — before finally admitting that, in a sense, everything functions like a slot machine.